Georgia Spinal Health & Wellness, a unique chiropractic provider with multiple offices in Atlanta, is pleased to add cryotherapy treatment to their arsenal of medical therapies. Cryotherapy is a whole-body exposure to subzero temperatures used to decrease inflammation, promote weight loss, speed recovery, decrease pain, and improve overall health and wellness. We are thrilled to be a qualified provider for cryotherapy in the Atlanta area. This innovative therapy activates natural healing powers and provides a full scope of profound benefits for the entire body, says Dr. Bradley Hochman, D.C. of Georgia Spinal Health & Wellness. Georgia Spinal Health & Wellness in Atlanta offers a distinctive and valued approach to chiropractic care with the use of multi-disciplinary treatments to treat chronic pain and improve physical health and wellbeing. The top-rated practice is equipped to provide integrative care to those who need rehabilitation after sports injuries and personal injury cases as well as those that need management for chronic pain and generalized fatigue. Recently, Georgia Spinal Health & Wellness has expanded their superior menu of medical therapies to include cryotherapy treatments. With their ability to offer treatment outside the scope of traditional chiropractic care, Georgia Spinal Health & Wellness now offers the innovative treatment of cryotherapy. Cryotherapy exposes the whole body to subzero temperatures in a nitrogen filled chamber for three minute sessions. This stimulates and accelerates the body’s natural ability to heal itself. Cryotherapy is safe and proven to provide a wide range of health and cosmetic benefits, including increased blood flow, rejuvenated skin, decreased pain/fatigue, reduced inflammation, faster tissue repair, boosted metabolism and much more. Patients who need help with injury recovery, sports performance, weight loss and overall wellness can benefit from cryotherapy treatment. “We are thrilled to be a qualified provider for cryotherapy in the Atlanta area. This innovative therapy activates natural healing powers and provides a full scope of profound benefits for the entire body,” says Dr. Bradley Hochman, D.C. of Georgia Spinal Health & Wellness. Georgia Spinal Health & Wellness is staffed with a renowned group of Medical Physicians, Doctors of Chiropractic, Therapists and Diagnostic Technicians. They serve patients from multiple office locations, including those in Atlanta, Chatsworth, Dalton and Lilburn. Georgia Spinal Health & Wellness is led by a team of experienced and highly trained professionals, Dr. Todd Surloff, D.C., Dr. Bradley Hochman, D.C., Dr. Nicolle Martin MD, MPH and Dr. Kenneth Bartlett, D.C. Together, they can address patient pain and injury through multidisciplinary methods that support long-lasting rehabilitation and optimal wellness, including massage therapy, nutritional counseling, mental health, chiropractic solutions, medical care, physical therapy, and more. The staff of Georgia Spinal Health & Wellness believes in delivering a compassionate and tailored approach to each patient, regardless of the severity of their needs. 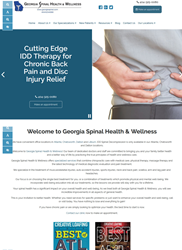 For more information about the services offered at Georgia Spinal Health & Wellness please visit http://www.georgiaspinal.com or call the Atlanta office directly at (404) 325-0080.